Mike Rutherford has been in the music business for almost 50 years now. He has played in seedy clubs, in giant stadiums, created immortal bass lines, left his imprint on music history and provided unintentional comedy as the singer on his second solo album. But Mike has always done his thing. Not many musicians are lucky enough to have get a second good band going like Mike did with his Mechanics beside Genesis. The Mechanics have never been a copy of Genesis and the music has never been geared towards fans of progressive rock. The Mechanics have always been a pop band that tried out many different things within the borders of popular music, but they have always focused on good tunes and accessible music. Mike is getting on towards his 70th birthday now, and many fans of his old band Genesis are a bit confused why he keeps this pop project alive. In fact, the Mechanics seemed to be over. Paul Young’s death in 2000 was a loss the Mechanics could not survive – that, at least, was public opinion then. Nevertheless they came back with Rewired, which was, interestingly, by Mike + The Mechanics feat. Paul Carrack. For Mike, Rewired became what Abacab was for Genesis. Not everybody liked it, but the band obviously wanted to do something different and came up with this very interesting album. Mike, funnily enough, appeared to be less satisfied with the outcome and the Mechanics rested – until Mike apparently felt bored after the end of the Genesis tour 2007. He met singers Andrew Roachford, Arno Carstens and Tim Howar, who in turn sang on the Mechanics latest album, The Road. Several songs on it had quite some potential, but the overall problem was that it sounded strangely forced. Background Noise is the title of what was arguably the best song on the album – with vocals by Arno Carstens who soon vanished from sight. In 2011 the Mechanics began to play gigs again. Mike, Tim Howar and Andrew Roachford were usually accompanied by Gary Wallis, Luke Juby and Anthony Drennan on stage. This team closed ranks and became a solid band. Since then the Mechanics have played many shows each year, and everybody who went to see them confirmed that they are a terrific live line-up. Nobody could guess, of course, that it would take the band six years to record a new studio album. In the meantime, at least, they released a new song, When My Feet Don’t Touch The Ground, on their “best of” compilation The Singles. All the while they were encouraged to make a new album, but at the same time expectations grew to absurd heights. Fans, each in their way, demand the maximum. Social networks, internet fora and other places of exchange have established an utterly new way of discussing music. All of a sudden, YouTube snippets become relevant, everything is consumed faster, judged faster – people do not take as much time. But they should take their time for Let Me Fly, easily accessible though the album may be because of its genre. I have chosen not to listen to the precursor single Don’t Know What Came Over Me but wait for the album in its entirety. Visually, Let Me Fly is completely different from The Road. There is no writing on the cover. The album comes in a fine digipak with a booklet filled with additional information, accompanying text and the lyrics. We find out that Mike himself is responsible for the visual concept. We learn that the songwriters influenced the process, and the band consists of six musicians – years ago the Mechanics were billed as a trio. It is rather difficult to describe the flair of this album. Now and then you get the impression that you hear bits of sounds from way back when. Some moments sound like Living Years, others may remind you of a mixture of Beggar and the debut album, and other songs might make you think of Word Of Mouth. Comparisons like these are cheap when a band has that kind of history. In fact, the album also has a very modern flair, there is an idea of “the best of both worlds” that I would liken to they way gardners tend to both, the roots and the flowers of shrubbery. The opening song takes in the listener. A richly textured song sets off Andrew Roachford’s excellent voice. Choir elements awake memories of The Living Years, particularly with the final climax. Add to these drum computer sounds, well-known from the 80s. Don’t Know What Came Over Me confirms that all the songs on the album have a similarly high level. The melodies are catchy and there is a nice variety in the arrangements. Interestingly, Roachford sings the chorus much lower than the verses on that particluar one. Until here, calmer songs follow up-tempo songs. Then, High Life is a kind of detour. Sparsely instrumented, it is a welcome breather between lush sound blankets. The Letter may well be the best song on the album. It combines much of the Mechanics’ history – there are moments where you may want to sing “can you hear me?”, but then the sound turns to Living Years, or is it M6? The Letter is some kind of musical autobiography of the band, complete with a little solo from Mike! Another song in this category might be I’ll Be There For You – there is some of the production style of Now That You’ve Gone in it – more on that in a bit. The song is edgy, and is really a good-vibe song. Since Howar sings “only” backing vocals on Not Out Of Love it is Roachford who is “way ahead”. The M6-album had a similar vocal share. 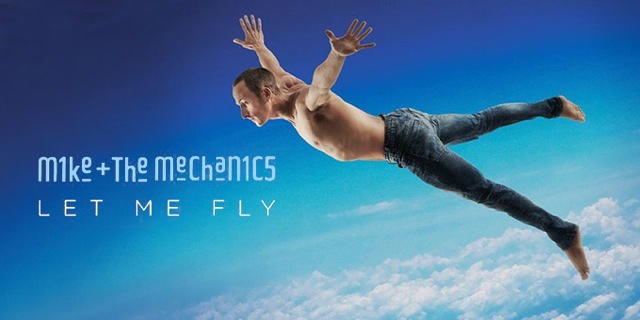 The Mechanics have always had an interesting mix of songwriters and producers, and they keep it up on Let Me Fly. Clark Datchler, known as the head of Johnny Hates Jazz, is probably the best-known of them. Brain Rawling and Mark Taylor may be less familiar names, but their work on Cher’s album and song Believe is not only very popular but also led to the sound of the Mechanics single Now That You’ve Gone. Mark Taylor also co-wrote two of the best songs on the album, The Letter and I’ll Be There For You. Other co-writers are Patrick Mascall, who worked with Tim Howar in his band van Tramp, Ed Drewitt and Fraser T. Smith. More information on them below. 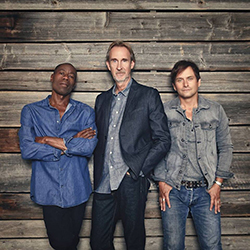 Of course, Mike Rutherford himself and Andrew Roachford and Tim Howar wrote or co-wrote many of the songs. Mike's son Harry is also one of the co-producers o this one. The production sounds like a mixture of modern and retro. The album is, however, well-rounded as far as the production is concerned, which shows in the fact that, the title song excepted, there are no fade-outs but regular endings. Six years ago Mike re-formed his Mechanics. Long tours have forged the line-up into a band. Mike took his time to make the new studio album that has come out on April 7 on BMG. The (still) new singers Andrew Roachford and Tim Howar are involved in the creative process, and there is a host of interesting co-writers and co-producers. The material moves between solid and excellent. You may perhaps miss a über-hit, but then all the songs are equally good. There is no song that is inferior to the others. Neither is any song absolutely superior. You can hear that the songs are based on fresh ideas. This is a hungry band. This is no music for blinkered fans of progressive rock, but an album you can enjoy with the certain knowledge that you are offered good quality songs. 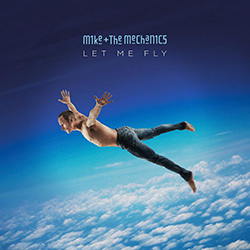 32 years after their debut album Mike + The Mechanics release Let Me Fly, a wonderful pop album. There is absolutely no reason why this should be their last. Mike finally lets his Mechanics fly. And boy, do they soar! Mike + The Mechanics will be on tour this year - detauls can be found on our tour date spage here. Let Me Fly, Are You Ready and Not Out Of Love were already performed live occasionally in recent years. Born in 1964, Clarc may be known well as singer of the band Johnny Hates Jazz. Datchler has also worked in Peter Gabriels Real World Studios and parts of this output was eventually released on his Tomorrow solo album. During the last few years, Datchler and his old bandmates reunited for a tour and new album. Datchler is involved in eight of the twelve tracks on Let Me Fly. Born in 1988, Ed is a songwriter, who has worked for The Wanted, Olly Murs and One Republic. A lot of his tracks entered the UK Top 5. Occasionally, he has also released material under his own name, in collaboration with Professor Green ans they also launched a Top 5 hit. For Let Me Fly, Ed co-wrote the track High Life with Mike. Patrick was part of van Tramp - Tim Howars band before he joined the Mechanics. He also did some songwriting for people like Cher and Boyzone (besides a lot more). On Let Me Fly Patrick co-wrote two tracks. is a songwriter and producer and his references are stunning: He has worked for Tina Turner, Lady Gaga, Lionel Richie,was involved in Chers hit album Believe, worked with Rod Stewart, Ronan Keating, Britney Spears and many more - and he has also been working with the Mechanics in the past. The single Now That You've Gone was produced with his help. Taylor is listed as co-author for two tracks on Let Me Fly and was most likely also involved as a producer. Born in 1971, Fraser is a British songwriter, producer and musician. He has worked for Adele, James Morrison, Craig David, Keane and also the Kaiser Chiefs (to name just a few!). On Let Me Fly he co-wrote the last track, Save My Soul, with Roachford and Rutherford. Brian is an English producer. He has worked for Cher (with Mark Taylor on her album Believe), Tina Turner, One Republic and also David Bowie. Rawling is the prodicer of Let Me Fly, possibly together with Mark Taylor.